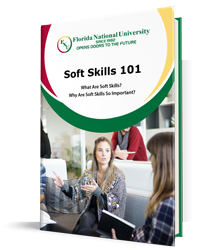 You should start developing the skills now that employers need in their clinics, while you are enjoying your studies in anticipation of working in the field you’ve chosen. This begs the question, though: what, specifically, are they looking for? 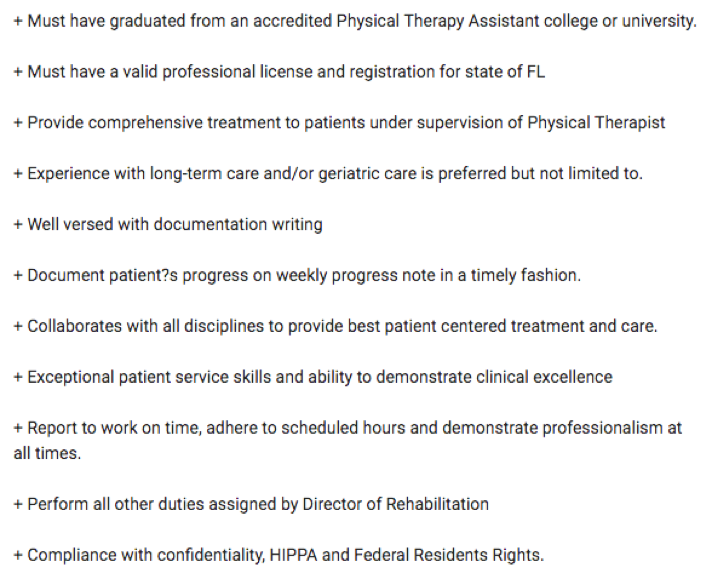 Our department heads at Florida National University have built the Associate of Science Degree in Physical Therapist Assistant around this known skillset, but we can best illustrate it here for you by surveying typical, actual job postings. This is a big distinction that could vary your salary earnings greatly when looking for a position in healthcare. If you search Physical Therapist Assistant versus Aide, you will come across very different salary ranges. Just so you get a sense, as an Assistant you can top salary ranges in Florida. Infographic: US Bureau of Labor Statistics for May 2017 wages for Physical Therapist Assistants. 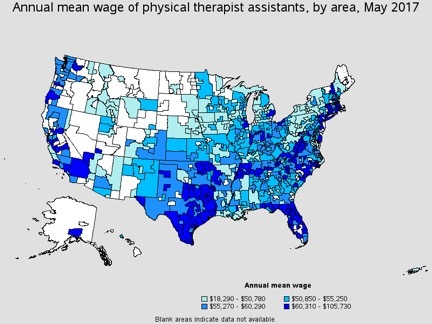 Nationally, the Mean Annual wage for a Physical Therapist Assistant, according to the BLS is $57,620, while in Florida it is 5k higher at $62,710. As you can see, the first requirement is a degree from an accredited university. The program at FNU is accredited by the Commission on Accreditation in Physical Therapy Education (CAPTE) and the university is accredited overall by the Southern Association of Colleges and Schools Commission on Colleges to award associate, baccalaureate and masters degrees. Empathy, a quality that is nearly impossible to teach but is often listed. Read more here about what motivates a PTA. Also, the program requires 13 credits (3 classes) of practicum, which will put a checkmark in another box that hospitals look for: experience. Our accredited program also gives you the credential to sit for the national licensure exam. Our daytime program at the Hialeah campus is a two-year tightly tracked program, however, you can even complete it in less time. The classes are scheduled such that once you start you can continue on the track and ensure completion. You can start your FNU admissions process here, through our online form. You’ll have to have a minimum GPA of 3.0 and a “B” in general prerequisites, especially in Anatomy & Physiology, Introduction to Physical Therapy, Physics, and Algebra. Later on in the process, you’ll also attend an obligatory orientation session and fill out the PTA-specific application. With the support of a university whose mission is to serve their immediate community in Hialeah in their quest for career advancement, the FNU professors are your support in ensuring that your program and in-clinic practice are fruitful and successful. Don’t hesitate to call FNU at 305-821-3333 and ask to speak to someone in the Physical Therapy department. We’ll be happy to hear from you and discover together if you’d make a good fit for the field.